Some glorious images in this exhibition of aerial photographs of Britain now showing in Bath. This isn't from the exhibition! I haven’t been able to see it myself, but you can just spend five minutes watching this beautiful slideshow with commentary from the BBC website. From glacier-carved mountain valleys to jagged saw-toothed coastlines, the UK’s diverse physical and human geography – as seen from above – is being celebrated in a new street exhibition in Bath. More than 100 colourful aerial images – showing Britain’s natural and human landscapes – are being showcased in Bath city centre. Take a look here with the Director of The Royal Geographical Society, Dr Rita Gardner. Back in May I posted about the 100 greatest inventions of all time. I’ve just read an article by Alice Rawsthorn about an exhibition at the Vitra Design Museum in Germany with the title “Hidden Heroes: The Genius of Everyday Things”. The focus here is not just on inventiveness or novelty, but the way a simple idea, when combined with a good design, can become a central part of ordinary life that we couldn’t imagine living without. We don’t reflect enough on the genius of these objects: the corkscrew, paper clip, clothes pin, rubber band, egg carton, shipping container; together with the thirty other useful and familiar objects contained in this exhibition. 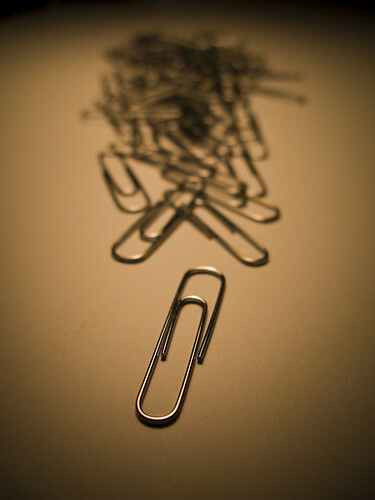 It’s only when something as mundane as a paper clip is put in a display cabinet in a museum that you appreciate it’s value and beauty. Nothing to do with the Papal visit: I just came across this article about how attendance at Christian services in Britain has not been declining over the last five years or so, and in one or two areas has actually been increasing. The ‘not declining’ tag might seem rather negative and un-newsworthy, but it is quite a powerful news story when you set it against the common journalistic assumption that Christianity is on the back foot and is unlikely to exist as a significant part of British life a generation from now. It’s time to believe that the church in this country is no longer in decline. The latest statistics coming from various denominations are clearly showing stability in church attendance and even signs of growth. This news may come as a surprise to many people who believe that the church is a dying institution. But the news is no surprise to us at Christian Research. We’ve been watching the church adapt and change over recent years, and have been collecting statistics for some time which suggest that the church in this country is in reasonably good health. There is now enough combined evidence to state confidently that the decline is over. 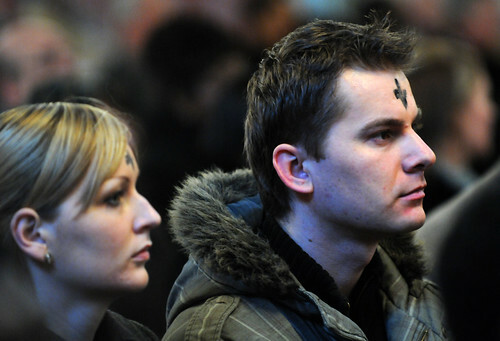 The long term decline in weekly Mass attendance in the Roman Catholic church in England and Wales ended in 2005 and the figures have been broadly stable since. In 2008 there were 918,844 attending Mass, an increase from 915,556 the year before. The Church of England has seen fairly steady attendance over the last ten years, with 1.67m attending services each month in 2008, compared with 1.71m in 2001. An important point to note is that the statistics over the past decade include all worship during the week, and not just Sunday morning services. One of the most significant changes we have been monitoring in the church is the growth in mid-week worship, which is an indication of how the church has been adapting and changing over recent years. 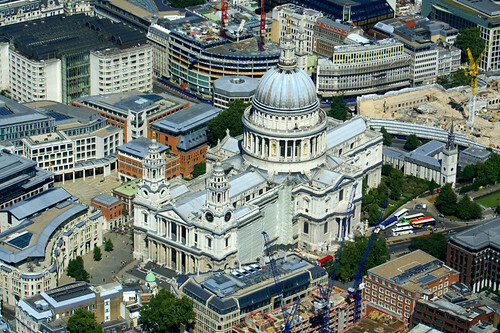 The Baptist Union of Great Britain has seen attendance rise from 148,835 a week in 2002 to 153,714 in 2008, with particular growth in the contact with young people aged 13 to 18 – up from 34,095 in 2002 to 41,392 in 2008. In July of this year Christian Research conducted 1000 interviews in the streets of 44 locations in England and Wales with a representative sample of the population. 63% think of themselves as Christian, 14% said they attended church at least once a month and 29% at least once a year. Those are significant proportions of the population. The research also shows that 41% of adults agree “The Bible is an influence for good in society”. Just last week there was also research published which showed that two in three adults agree “British Society should retain its Christian culture”. All of this paints a picture of the church as living movement rather than a dying institution. And it is a living movement which is generally recognised as a good influence in society, one which many people do not wish to see decline and die. It is time to stop talking about the decline of church and start facing up to the fact that it is here to stay. Every now and then you experience something completely new, a window into another world that you hadn’t anticipated, but one that may well become ordinary in a year or two. 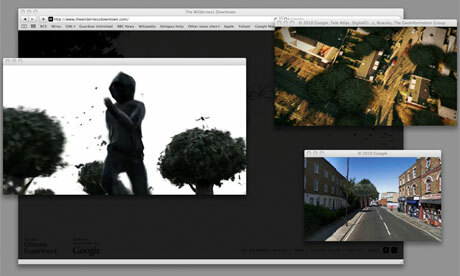 I’ve just been watching The Wilderness Downtown, an interactive and personalised ‘video’ that takes you back to the place you were born. It keeps crashing on me, but I’ve had enough of a blast to be inspired – it’s the heavenly Arcade Fire video built in collaboration with Google and director Chris Milk. 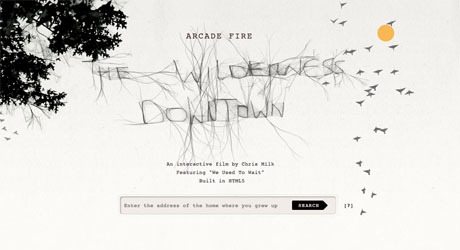 The Wilderness Downtown combines Arcade Fire’s We Used To Wait with some beautiful animation and footage – courtesy of Street View – of your childhood home – made all the more poignant for me because it was bulldozed a few years ago. The Chrome Experiments blog explains each technique, including the flock of birds that respond to the music and mouse movements, created with the HTML5 Canvas 3D engine, film clips played in windows at custom sizes, thanks to HTML5, and various colour correction, drawing and animation techniques. I’ve watched thousands of videos thanks to the curse of the viral video chart and nothing has come close to this for originality, imagination and for that inspired piece of personalised storytelling. There’s plenty more inspiration on the Chrome Experiments blog; Bomomo is pretty slick, and Canopy is hypnotic. Sometimes, especially when I am tired, I can become paralysed in front of the Pret a Manger sandwich displays; utterly incapable of deciding whether my life will be marginally more fulfilled by eating a healthy-looking falafel and humous on seeded-bread or a dolphin-friendly tuna and cucumber baguette or a good old-fashioned cheese and pickle – and that’s without getting even more confused by the sushi and the soup; and the only thing that snaps me out of it is not hunger or the need to get anywhere soon, but the sudden realisation that I have been standing like an Antony Gormley sculpture for what seems like six hours in a public space where it is socially unacceptable to pause for longer than six seconds – a mixture of self-consciousness, shame at this psychological dysfunction, and fear that the police or medics or anti-terrorist squad will be arriving at any moment to carry me away. In these very limited circumstances (Pret a manger, tiredness, etc. – now I am feeling defensive and trying to backtrack…) I am what they call an indecider. A recent report from the University of Bristol called ‘Confused Nation’, cleverly sponsored by Confused.com, reveals that many of us feel more confused than we did ten years ago, and 42% of the UK population lie awake at night trying to make decisions. The report also shows that nearly half of all Brits (47%) confessed even little decisions can be hard to make, largely caused by an overwhelming amount of choices hindering the ability to make decisions quickly and confidently. Professor Harriet Bradley from the University of Bristol comments: “With a constant stream of new media, daily technological advancements and aggressive multimedia advertising, it’s no wonder that over half of Britain thinks life is more confusing for them than it is for their parents. We really are becoming a nation of ‘indeciders’. It is not only the ‘big’ areas of life that are causing confusion. Although politics is the area people find most confusing, with 65% of the UK reporting confusion over the policies of major political parties, the survey also found 69% of the country failed to understand bankers’ bonuses and interest rates. What to wear at certain occasions, predictive text and flat pack furniture were also identified as key areas of confusion. The most confused person in Britain is likely to be a 17 year old girl living in Cardiff, whereas the least confused person is likely to be a 60 year old man living in Edinburgh. Let’s hope they don’t have any Pret a Manger outlets in Cardiff. They are tracking you – if you are a toddler being cared for at a certain Parisian crèche. This centre is planning to monitor the movements of the children placed in its care by placing a tracking chip inside their clothing. It’s the first time this technology has been used in Europe. What’s your gut reaction to hearing this? Horror? Indifference? Relief? Is it any different from tying a rope round your toddler’s wrist? 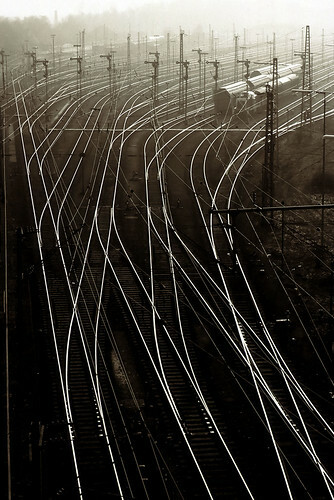 Is it any more intrusive than the tracking that’s already taking place through your Oyster card or your mobile phone? If you could surgically implant a tiny tracking chip into your child for just a few pounds – would you do it? The plan by the crèche, which is privately run, has provoked criticism from the French childcare industry, with experts warning the measure is both pointless and potentially damaging. Some critics say it is more about cost-cutting than child-safety; others that it’s simply unnecessary – given the fact that the closed environments of these childcare centres are nearly always safe and secure. The most extreme critics accused the Lyberta scheme of starting France on the slippery slope towards a generalised surveillance society. “Chips in crèches take us a step closer to this hellish world where Big Brother reigns,” commented a blogger by the name of Victorayoli on the Mediapart website. After spending the whole of yesterday at Westminster, seeing the Popemobile drive past the excited crowds, and later on managing to see him emerge from Westminster Abbey, it’s hard not to blog about the Papal Visit. a pluralist democracy which places great value on freedom of speech, freedom of political affiliation and respect for the rule of law, with a strong sense of the individual’s rights and duties, and of the equality of all citizens before the law. Then come the questions: How are you going to hold onto these values? What has been their foundation in the past? What will serve to secure and sustain these noble values for the future? How will you do this without some sense of an objective moral order, a transcendent meaning, a loving creator, and an ultimate purpose? The hard questions that he does ask, the challenges to ‘aggressive secularism’, only arise because he actually cares for this British culture and worries that it is in danger of undoing itself. I hope that among those of you listening to me today there are some of the future saints of the twenty-first century. What God wants most of all for each one of you is that you should become holy. He loves you much more than you could ever begin to imagine, and he wants the very best for you. And by far the best thing for you is to grow in holiness. Allow me also to express my esteem for the Parliament which has existed on this site for centuries and which has had such a profound influence on the development of participative government among the nations, especially in the Commonwealth and the English-speaking world at large. Your common law tradition serves as the basis of legal systems in many parts of the world, and your particular vision of the respective rights and duties of the state and the individual, and of the separation of powers, remains an inspiration to many across the globe. And finally, for a bit of fun, for those of you have made it to the bottom of the post, here is me inspecting the Popemobile for CNN.